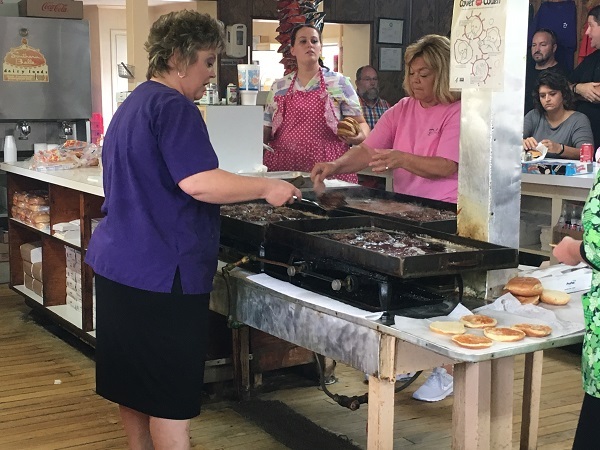 Dovie’s, Tompkinsville KY – Marie, Let's Eat! When we moved here last summer, I hoped that we’d start to cover Kentucky a little more and visit a wider variety of places than we have. Better late than never, I suppose. Tompkinsville, a slowly shrinking town of about 2200, is just a little further of a drive than Nashville from us, and as a bonus, the road goes through Cookeville TN, a city I’d been wanting to visit anyway because they have a children’s museum. So one Saturday last month, we got out bright and early, and drove up TN-153, US-27, and TN-111 to Cookeville and relaxed for an hour at their pleasant little museum. It’s among the smallest that we’ve visited, and probably won’t please any kids older than seven, but it’s just about fine for kids under that bar, and we’re very pleased that the place exists at all in such a small community. Our son got some energy out and we built with blocks and then we stopped by the Russell Stover outlet attached to the factory and got back on the road. Shortly before noon, we’d taken our places at the counter – the last places where the three of us could sit together – and watched the performance. Ringside seats, almost. 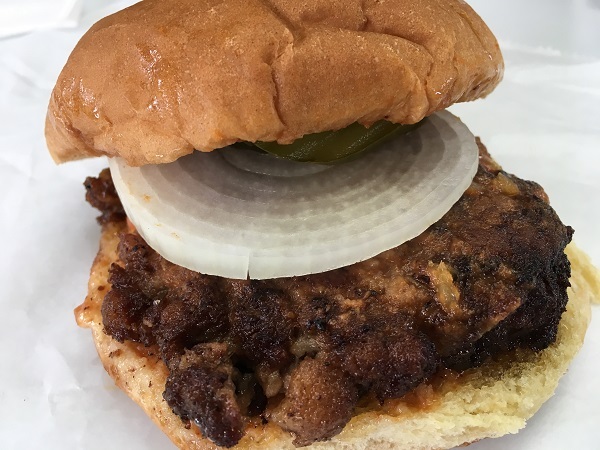 Dovie’s serves slugburgers, with the beef cut with some kind of grain, but these are completely and totally unlike any slugburger that we’ve found in the Tennessee River Valley. They’re neither crispy nor doughy; they’re oozing from all the oil in which they’re fried. They’re onto something here. These just don’t taste like slugburgers; they taste very much like the excellent burgers at Dyer’s in Memphis TN. It’s traditional here to either order your burger “squoze” or “unsquoze.” If you, for some odd reason, are worried about the oil, you should probably stay home with a salad. But if you insist on a burger, then they’ll give your patty a hearty squeeze between two spatulas to drain away some of it. I had mine unsquoze, of course, with a little drizzle of their special sauce – tomato-based, but not quite ketchup – and it is served with wax paper and onions and pickles for guests to dress when they’re ready to eat. They don’t have fries or a soda fountain here. We shared a bag of chips and had some canned RC Cola. They used to have these little eight-ounce glass bottles of RC, but I guess their distributor can’t get those anymore. Just one of these burgers is a gutbomb and all that anybody needs. (Oh, all right, Marie and our son had their patties squoze.) But they are delicious! 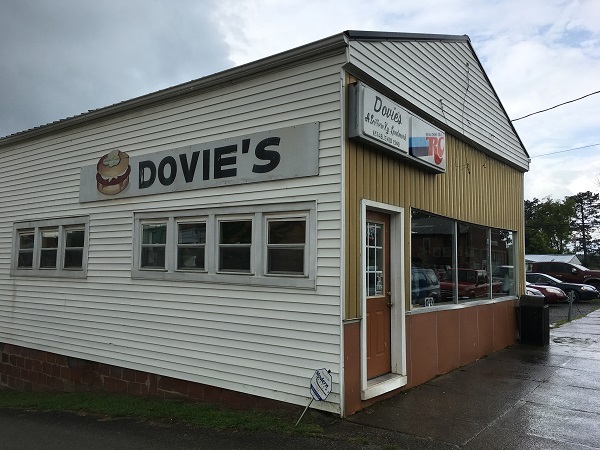 Dovie’s has won many awards over the years for serving one of, if not the very best, burgers in Kentucky. I don’t know of a better one, but then again, we have given very little coverage to Kentucky. Maybe one of these days we’ll do better! 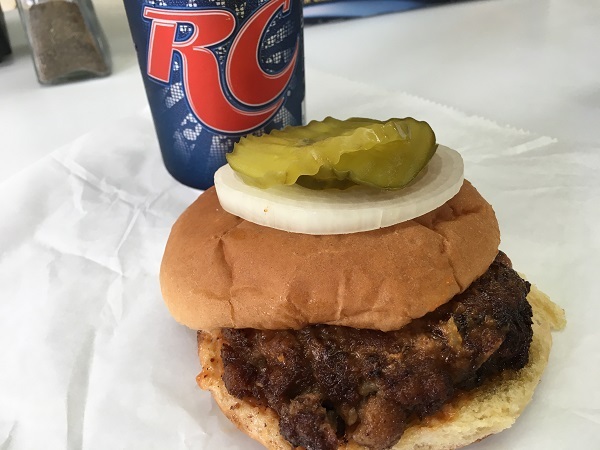 Ferrell’s in Hopkinsville is also excellent, and I wouldn’t mind having another of their burgers one day to refresh my memory and see which I like better. Don’t just read the blog! Follow us on Facebook, where you can get more information about our favorite places! Give us a like, hover over that LIKED button and check “Get Notifications”and please share and tell your friends to read us! Posted on September 19, 2017 by Grant G.Posted in burgers, kentuckyTagged burgers, kentucky, slugburgers, tompkinsville.